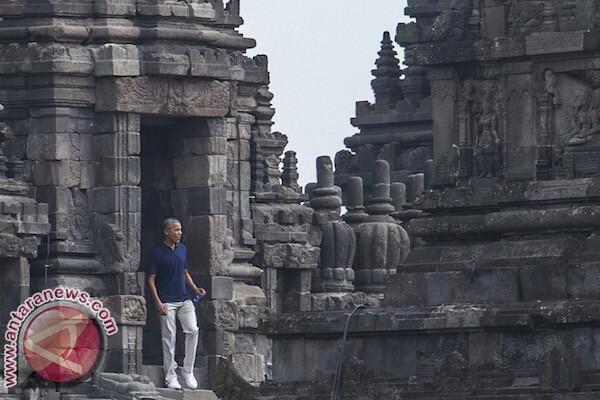 Former president of the US Barack Obama, along with his family and entourage, visited the cultural and historical attraction of the Prambanan Temple Complex in Sleman District, Yogyakarta Province, on Thursday. Obama and his entourage arrived at the Prambanan Temple area at around 9:15 a.m. local time through the south entrance. Thereafter, they walked together into the courtyard of the Prambanan temple complex from the southern side of the fence gate. Obama and his entourage also visited the Brahamana Temple, the main temple in the complex through the east side door. Obama and his children also took pictures using a pocket camera. Tourists standing outside the temple fence watched Obama enthusiastically and took pictures of him using their mobile phone cameras. They could not see Obama and his entourage clearly, as they were urged to stand 500 meters away from the temples fence. Obama and his entourage walked out of the area of the Prambanan Temple at around 10:10 a.m. local time.